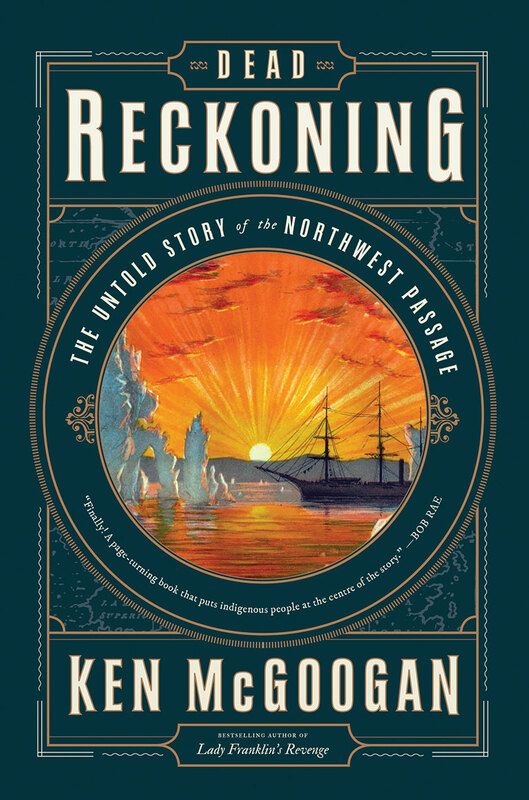 There is no shortage of books on the exploration of the Northwest Passage, so can there really be a story left untold? Author Ken McGoogan, who has written four other books on the Arctic, believes the answer is yes. With Dead Reckoning, McGoogan reconsiders the common theme — about brave explorers from Europe finding their way, slowly, through a great ice-covered mystery. McGoogan builds a strong case for the importance of the roles played by people who were able to draw from generations of knowledge about the region. His book reflects the increasing awareness and acknowledgement of Indigenous involvement in the exploration of the North, as well as of rescue missions. Without the help of those who lived in the area, many more people would have died, and it would have taken much longer to determine the best water route through Canada’s North. For more than a century and a half, much of the attention paid to the early years of Arctic exploration has put a spotlight on Sir John Franklin, who led an ill-fated expedition in the 1840s as he searched for the Northwest Passage to the Orient. Franklin, all of his men, and his ships disappeared — but, in the past few decades, additional evidence has been found. As a result, we now know more about the fate of the Franklin expedition. With recent discoveries and new ways of thinking, it’s time for the history of northern exploration to be rewritten. Parks Canada researchers found one of Franklin’s ships, Erebus, in 2014, and the other, Terror, in 2016. These two ships represent true sunken treasures, because the relics they contain — possibly including human remains — might answer many remaining questions about Arctic exploration in the 1840s. With new discoveries and new ways of thinking, the history of northern exploration needs to be rewritten. Books written a decade or more ago are out-of-date. As history is revealed, reshaped, and reconsidered, we need a fresh assessment of Franklin and the other early adventurers, including the First Peoples who made it all possible. McGoogan’s Dead Reckoning helps to fill that need. He draws from his past work but weaves it all together in a more complex and yet highly readable account that is enhanced with fresh insights based on new discoveries as well as more extensive research. For too long, the conventional narrative of the Arctic has focused on European names such as Franklin, Parry, McClure, Ross, Peary — and that of John Rae, who travelled through the area in the 1850s and discovered the fate of Franklin and his men. McGoogan goes deeper into the story, introducing us to Indigenous figures such as Thanadelthur, Akaitcho, Tattenoeuck, Ebierbing, Tulugaq, and Tookoolito. In the 1840s, Inuit saw living members of the Franklin expedition, and others later found their bodies. The information they provided to search parties led by Charles Francis Hall and Frederick Schwatka helped to uncover crucial clues about the fate of the Franklin party. More recently, information from the Inuit helped to drive the discovery of the two ships. Lady Franklin, Sir John’s wife, pushed her husband to embark on his final expedition. Later, she led the way (along with Charles Dickens) in dismissing the revelations of Rae and in denigrating his Inuit informants. As a result, Franklin’s fate became a matter of great controversy in England, with plenty of misinformation tossed this way and that. McGoogan sifts through the politics for us. Dead Reckoning is a superb work of Canadian history, and there is little to criticize. It sets a new standard and will be the starting point when considering the story of Arctic exploration from the sixteenth century onward. Book Review: Alfred Edwin “Eddie” McKay lived a brief life. He was born in 1892 and was killed in action in 1917 at the age of twenty-five.